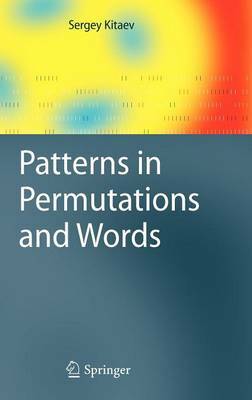 There has been considerable interest recently in the subject of patterns in permutations and words, a new branch of combinatorics with its roots in the works of Rotem, Rogers, and Knuth in the 1970s. Consideration of the patterns in question has been extremely interesting from the combinatorial point of view, and it has proved to be a useful language in a variety of seemingly unrelated problems, including the theory of Kazhdan-Lusztig polynomials, singularities of Schubert varieties, interval orders, Chebyshev polynomials, models in statistical mechanics, and various sorting algorithms, including sorting stacks and sortable permutations. The author collects the main results in the field in this up-to-date, comprehensive reference volume. He highlights significant achievements in the area, and points to research directions and open problems. The book will be of interest to researchers and graduate students in theoretical computer science and mathematics, in particular those working in algebraic combinatorics and combinatorics on words. It will also be of interest to specialists in other branches of mathematics, theoretical physics, and computational biology.